OMFSM. I love this picture. Love love love. Is it a ring of fire on Mercury? A look into the gateway of hell? A promo for Halo 3? Nope. 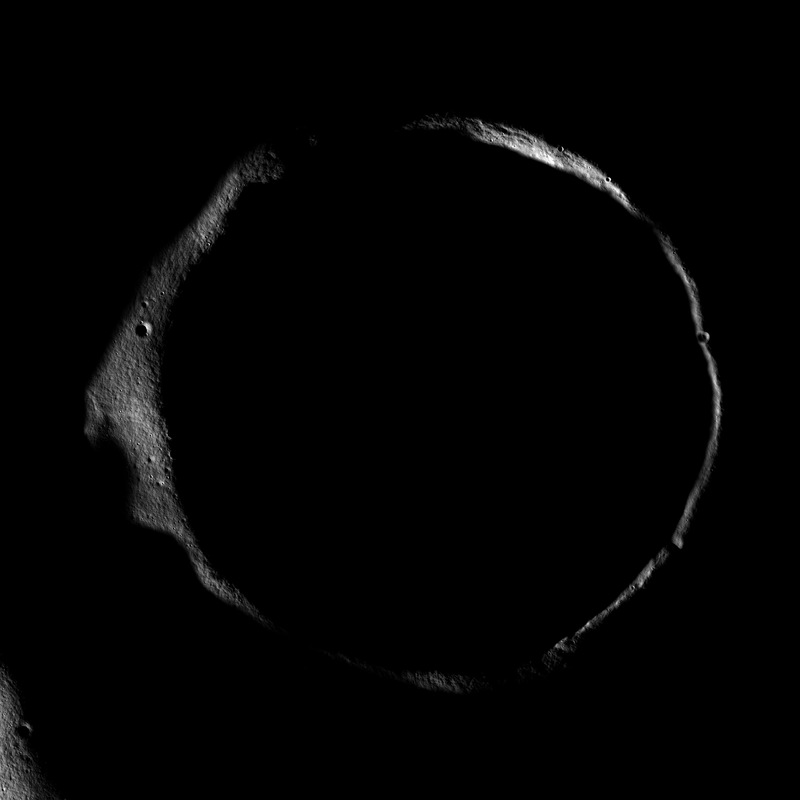 It’s far cooler: it’s the rim of the lunar crater Erlanger poking into the sunlight. Erlanger sits almost at the Moon’s pole, lying at a latitude of 87° north. At that latitude, the Sun is forever near the horizon, only getting a little above or below the limb depending on the Moon’s orbit around the Earth. In this case most of the crater is not lit by the Sun, but the raised rim gets up just high enough to see some sunlight, illuminating it in this wonderful way. Note the small patch of lunar surface to the lower left of the picture that’s in sunlight as well. That’s another indicator that how much sunlight you get at the Moon’s poles depends a whole lot on the local topography of the terrain. Um. Selain? Lunain? Whatever. Anyway, in this shot by the fantabulous Lunar Reconnaissance Orbiter, you can see that the rim of the crater has seen its share of action; it’s dotted with smaller craters from later, smaller impacts. That part of the Moon is lousy with craters; it’s an old region, meaning that the pelting it got from cosmic debris billions of years ago is still visible. On other areas of the Moon, like the dark patches you can see with your unaided eye, giant impacts flooded vast regions of the surface with lava, filling up and smoothing over any craters, wiping them off the face of the Moon. That never happened near the pole, so Erlanger still stands high and proud. But it also runs deep: the bottom of the crater is low enough to rarely get sunlight. Scientists think that ice from comet impacts over the eons may accumulate in such deep craters, so Erlanger is a prime target for LRO’s bistatic radar, which can penetrate into the lunar surface and reflect back to the probe. The type of reflection can indicate what materials lie beneath… including frozen water. LRO and the Indian probe Chandrayaan-1 just targeted Erlanger last week for such an observation. Will they find water? We don’t know yet. But we’re still looking, and in fact the other half of the LRO mission is LCROSS (Lunar Crater Observation and Sensing Satellite; follow it on Twitter! ), which will impact the lunar surface near the pole on October 9th of this year. The hope is that any water will be flung up into space where it will be more easily detectable. This has been tried before, but so far we’ve seen no water on the Moon. But maybe this next time we’ll strike transparent gold. And if we do, I wonder… is there a child already alive on Earth today who may one day drink Erlanger water as they sit on Armstrong Base, admiring the view of the lunar landscape out the mess hall window?